BEIRUT -- A stalled population transfer resumed Saturday after a deadly explosion killed at least 100, including children, government supporters and opposition fighters, at an evacuation point - adding new urgency to the widely criticized operation. The blast ripped through a bus depot in the al-Rashideen area where thousands of government loyalists evacuated the day before waited restlessly for hours, as opposition fighters guarded the area while negotiators bickered over the completion of the transfer deal. Only meters away, hundreds of evacuees from pro-rebels areas also loitered in a walled-off parking lot, guarded by government troops. Footage from the scene showed bodies, including those of fighters, lying alongside buses, some of which were charred and others gutted from the blast. Personal belongings could be seen dangling out of the windows. Fires raged from a number of vehicles as rescuers struggled to put them out. The scenes were the last in the unyielding bloodshed Syrians are living through. Earlier this month, at least 89 people were killed in a chemical attack as children foaming at the mouth and adults gasping for last breath were also caught on camera. The bloody mayhem that followed the Saturday attack only deepened the resentment of the transfer criticized as population engineering. It also reflected the chaos surrounding negotiations between the warring parties. The United Nations did not oversee the transfer deal of the villages of Foua and Kfraya, besieged by the rebels, and Madaya and Zabadani, encircled by the government. No one claimed responsibility for the attack but pro-government media and the opposition exchanged accusations, each pointing to foreign interference or conspiracies undermining the deal. “I know nothing of my family. I can’t find them,” said a woman who appeared on al-Ikhbariya, weeping outside the state hospital in Aleppo where the wounded were transported. A rebel spokesman said the car with the bomb had been parked in the area and abandoned. Another spokesman for one of the rebel groups that negotiated the deal said it is scarcely believable that the rebels would target their own fighters in such an attack. Yasser Abdelatif, a media official for Ahrar al-Sham, said about 30 rebel gunmen were killed in the blast. He accused the government or extremist rebel groups of orchestrating the attack to discredit the opposition. The Syrian Civil Defense in Aleppo province, also known as the White Helmets, said their volunteers pulled at least 100 bodies from the site of the explosion. White Helmets member Ibrahim Alhaj said the 100 fatalities documented by the rescuers included many children and women, as well as fighters. Syrian state media said at least 39 were killed, including children. The opposition Syrian Observatory for Human Rights put the death toll at 43, adding that it would likely rise because of the extensive damage. 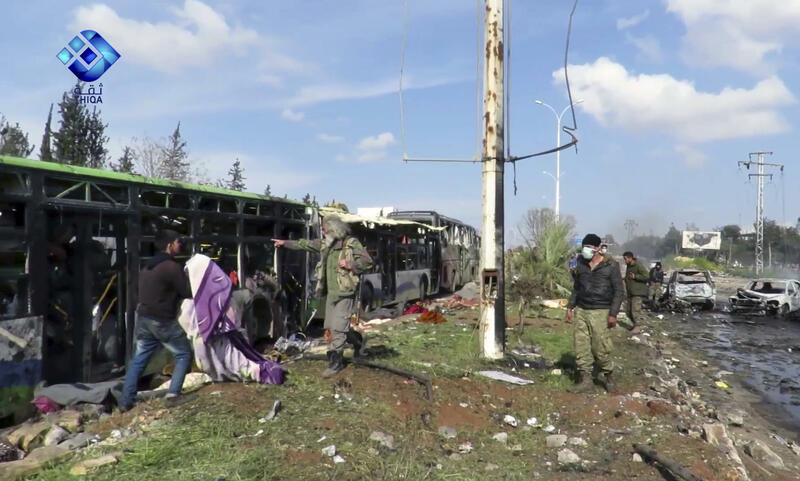 A Facebook page belonging to the pro-government Foua and Kfraya villages said all those in three buses were killed or are still missing while a rebel official said at least 30 opposition fighters who were guarding the evacuees were killed in the blast. According to Abdul Hakim Baghdadi, an interlocutor who helped the government negotiate the evacuations, said 140 were killed in the attack. He added it was not clear how many rebels were killed because they were evacuated to their areas. Hours after the explosion, the transfer resumed -- as dozens of buses, starting with the wounded, left to their respective destinations. Before midnight Saturday, 100 of some 120 buses from both sides had already arrived. The explosion hit the al-Rashideen area, a rebel-controlled district outside Aleppo city where evacuation buses carrying nearly 5,000 people from the northern rebel-besieged villages of Foua and Kfraya were stuck. Residents from the two villages had been evacuated Friday, along with more than 2,000 from Madaya, an opposition-held town outside of Damascus besieged by government forces.